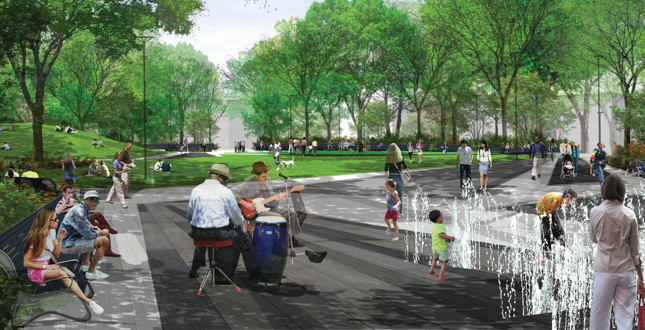 Although the physical qualities of Moore Square have changed dramatically over its lifetime, its civic legacy lies in its use as a social space defining improvements that enhance its social performance consistent with its character defining qualities as outlined by the national park service guidelines for historical landscapes. Only two Squares remain of the original 1792 five square town plan, yet the population of the Capital has increased more than 40,000% since its founding. The design builds upon its most unique and significant characteristics, but expands its experiential and programmatic range to accommodate a wider range of uses than the square offers today. 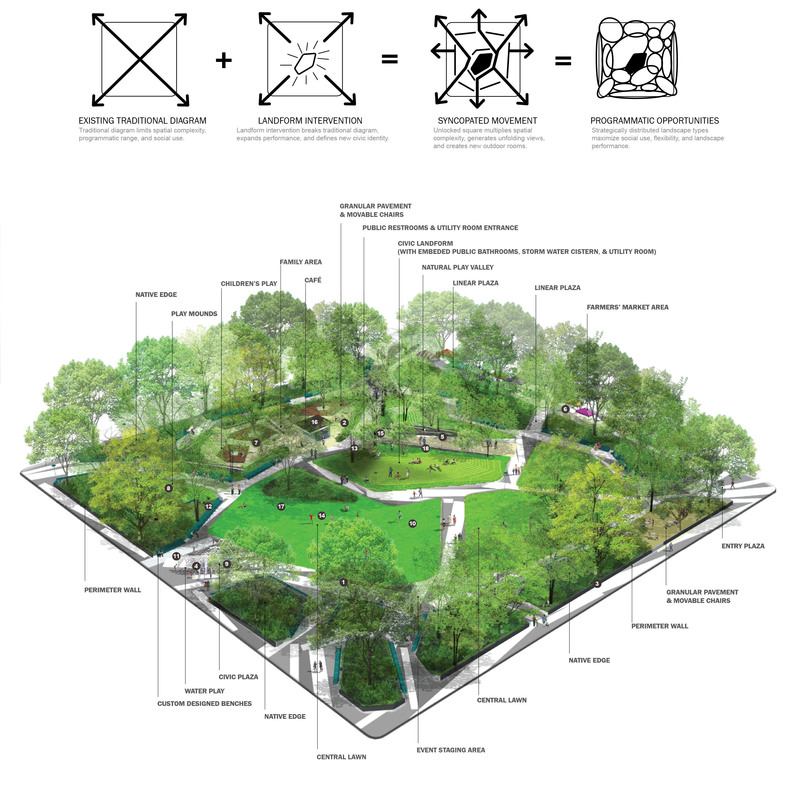 The landform intervention unlocks the full potential of the Square and transforms it into a high-performance urban landscape infusing its traditional one-dimensional plan with a multiplicity of landscape types, social spaces, and ecologies. Existing site is endowed with a mature grove of canopy trees. 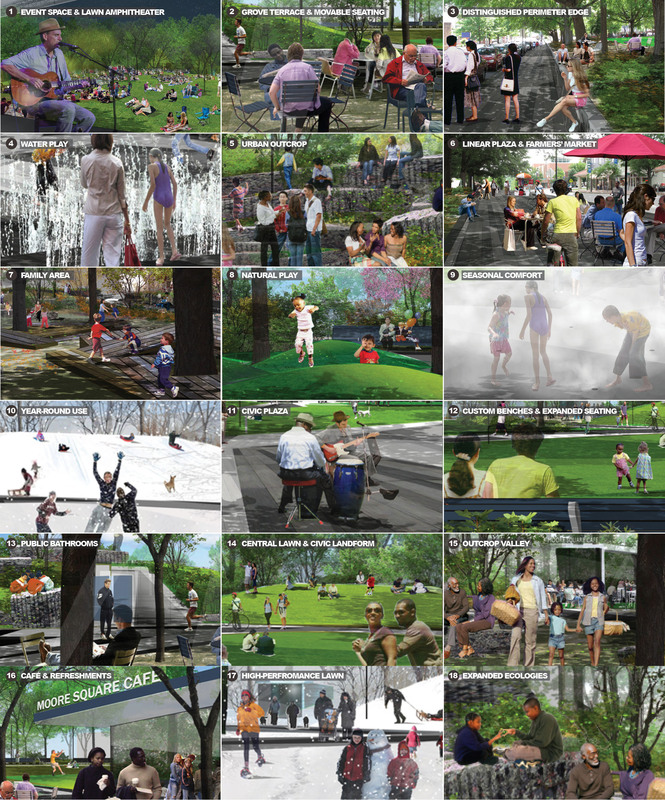 The long term protection, enhancement, and celebration of this beloved urban amenity are major drivers of the design. 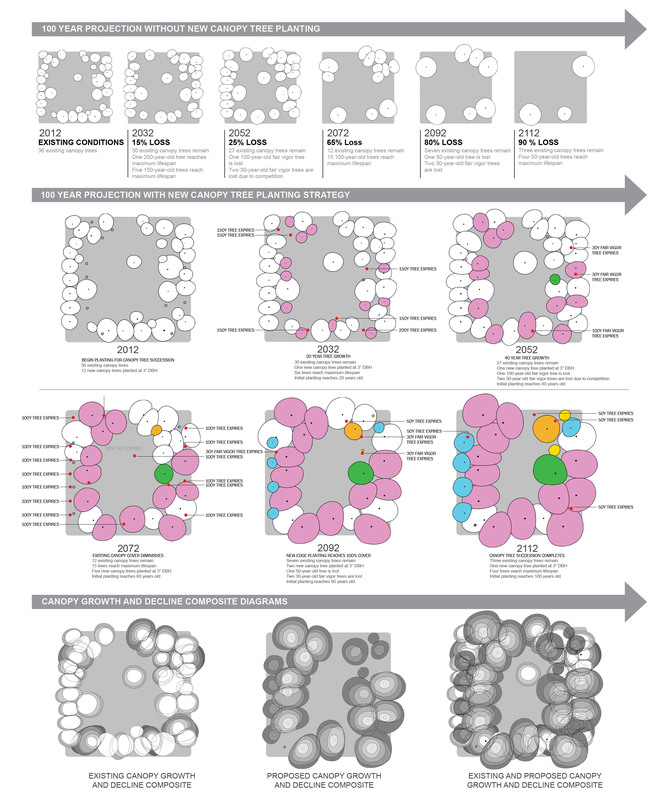 The design employs a science-based approach to evaluating landscape performance. 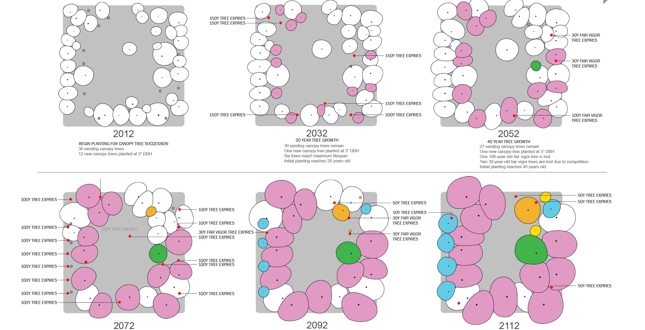 Proposed canopy tree planting locations, size, and species developed from detailed 100-year growth and decline projections. The resulting comprehensive recommendations emphasize the improvement of spacing, age diversity, and increased canopy cover. The gentle north slope of the landform becomes an iconic social generator, elevated prospect, and lawn amphitheater for formal and informal events. 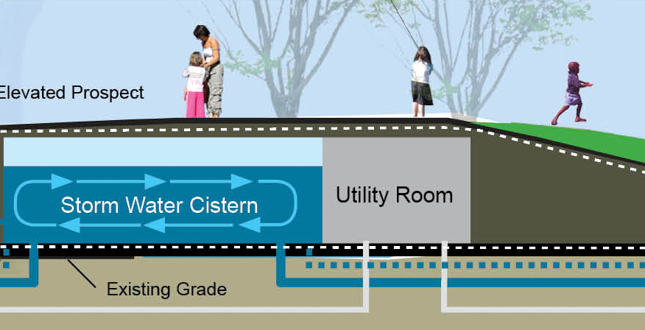 The landform acts as an above-ground infrastructure core that minimizes disturbance to existing root systems and houses a storm water cistern, bathrooms, and utility room. Landform South The multi-functional south face of the landform is articulated by native planting and stone outcrops that function as informal gathering areas, habitats and natural play zones for children. 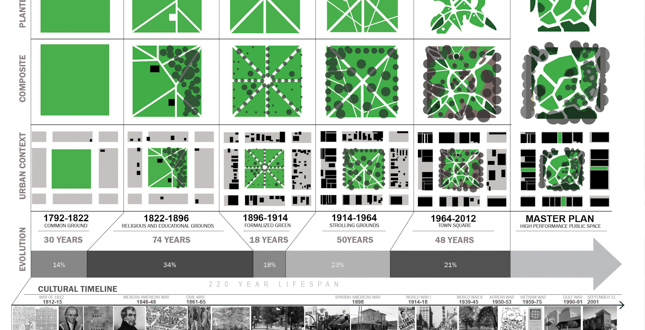 The interrelated layering of landscape types, program, and existing trees create a vibrant tapestry of dignified public spaces fitting of the square's rich ethnographic heritage. The civic plaza celebrates the square's African American heritage and becomes a popular place to People-watch, experience impromptu performances, and to feel the exciting vitality of Raleigh. The café and public bathrooms create a destination, provide refreshments, and invite citizens to occupy the Square and enjoy the richness of urban life. Moore Square, a four-acre, 220-year-old public space, is one of five original Squares established by William Christmas' 1792 plan for Raleigh, North Carolina. The Square is a deeply loved civic treasure that has fallen into disrepair and in need of improvements to accommodate the thriving urban life of downtown Raleigh. 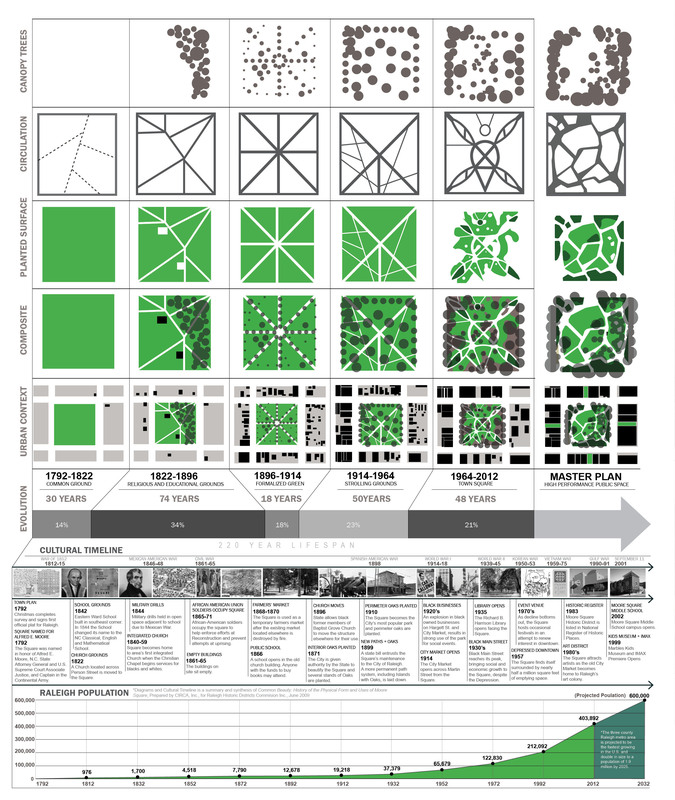 The Master Plan builds upon its most unique and significant characteristics, while expanding its experiential, ecological and programmatic range by introducing a centralized civic landform. Moore Square, a four-acre, 220-year-old public space, is one of five original Squares established by William Christmas' 1792 plan for the Capital of North Carolina. Of the three remaining Squares; Union Square has become the State Capital grounds, Nash Square has stabilized as a 19th century strolling garden and monument grounds, but Moore Square has maintained its identity and use as a public green. 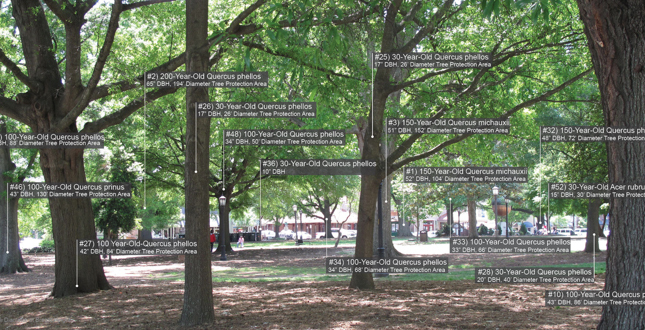 Deeply loved by the citizens of Raleigh and listed on the National Register of Historic Places, Moore Square is uniquely positioned to respond to the growing park needs of a City that has grown in population by more than 40,000% since its founding, while its originally planned public space network has diminished by almost 50%. 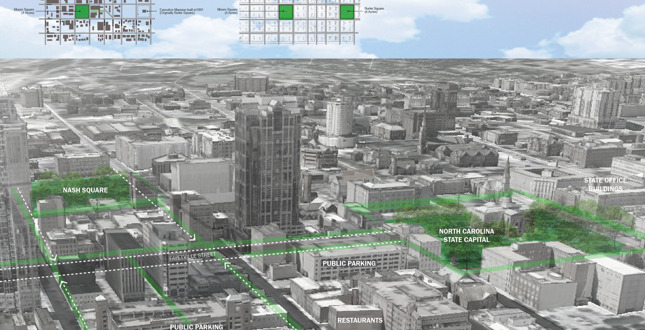 This growth is evident in the thriving urban context that surrounds Moore Square and includes a children's museum, public transit station, historic City market, and vibrant restaurants, bars, and cafés. 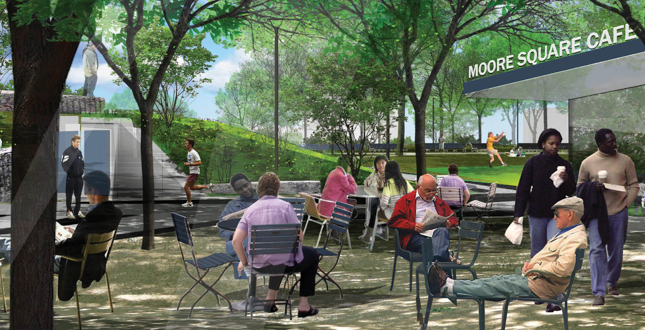 Moore Square is a civic treasure that has fallen into disrepair and is in need of improvements to accommodate the thriving urban life of downtown Raleigh. 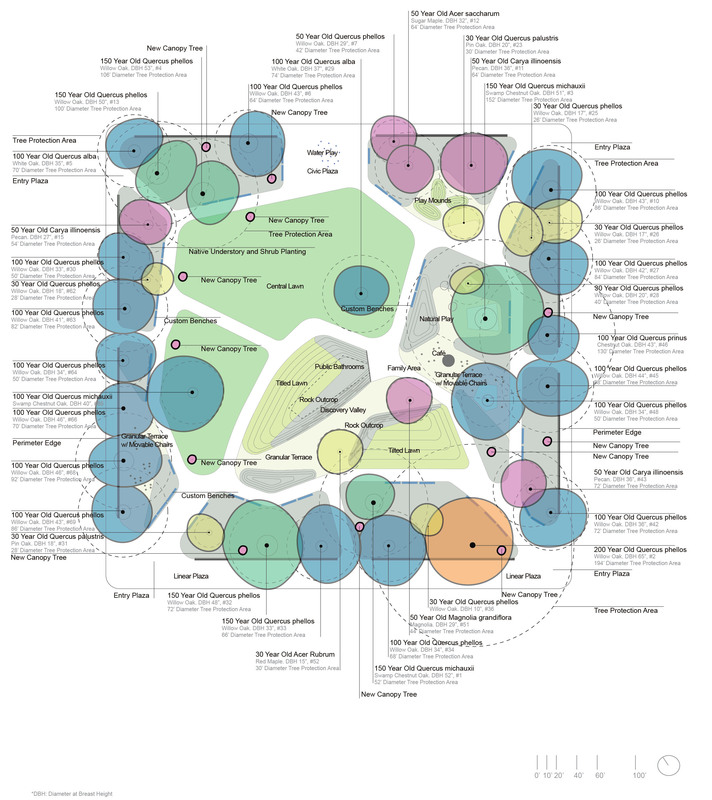 The Moore Square Master Plan builds upon its most unique and significant characteristics, and expands its spatial, experiential and programmatic range by introducing a centralized civic landform. This design feature energizes and organizes the site into visually and functionally distinct spaces to accommodate a wider range of uses than the Square offers today. 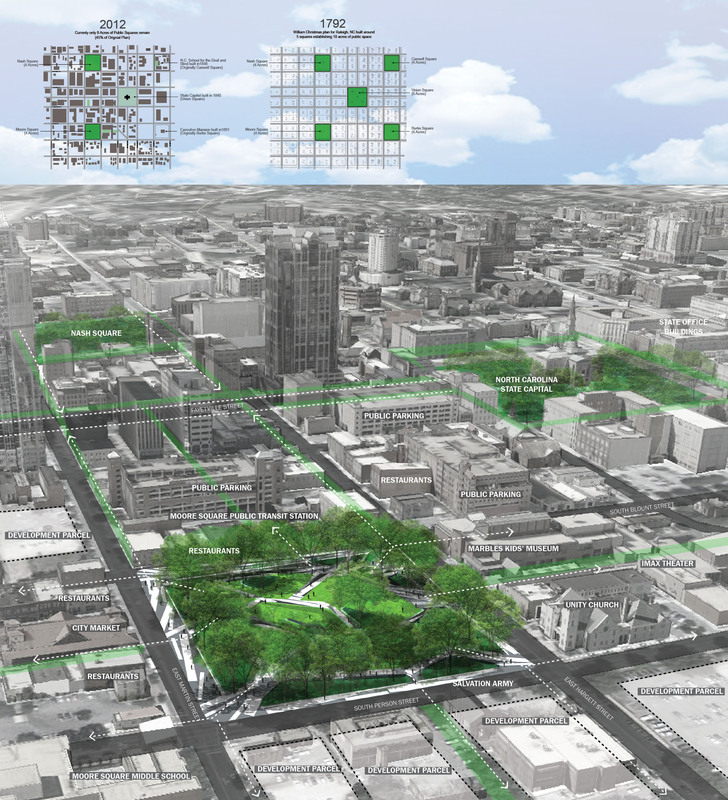 The central landform concept subtly breaks the existing traditional crisscross path structure, unlocking the Square's potential to provide 36% more paths, 250% more occupiable shaded areas, 39% more canopy trees, 1000% more formal seating opportunities, and 345% more native habitat, while maintaining open views through 95% of the site. 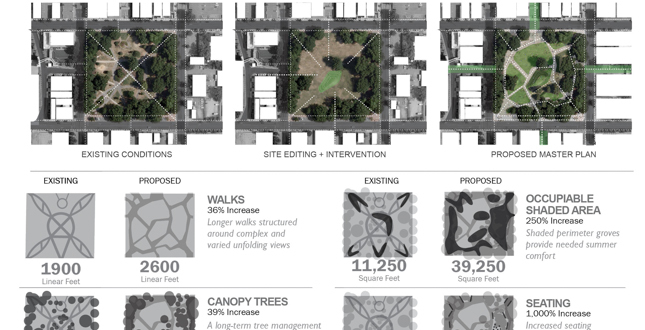 This simple intervention maximizes the efficiency of the four-acre site, amplifies choice of movement and range of experience for visitors, and shapes an outdoor environment that prioritizes occupation and flexible park use. 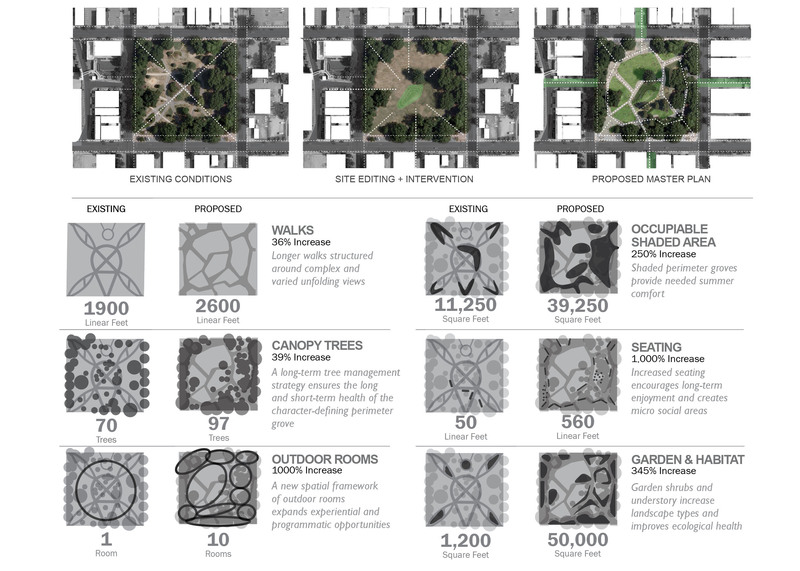 The Square becomes multidimensional, offering prospect, large expanses of open lawn, and places for refuge and recreation. Visiting Moore Square becomes an exploratory journey of unfolding views and diverse opportunities. The original entry paths are retained to minimize root disturbance and planters removed to deepen views. 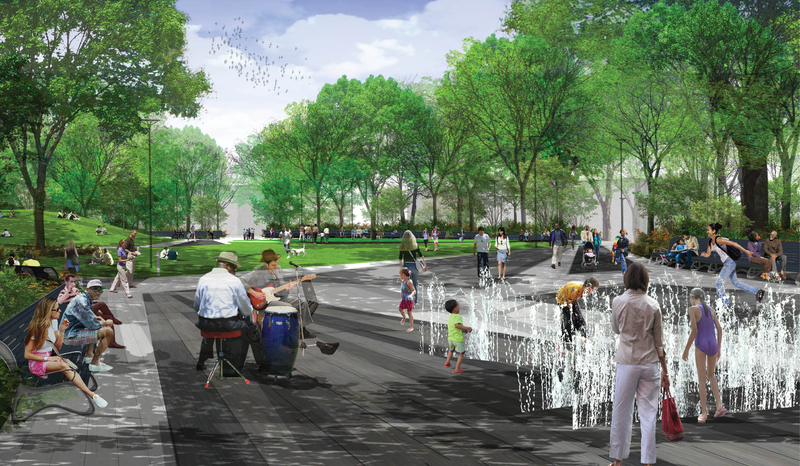 Existing path materials are recycled in the pavement pattern of an exciting and flexible new plaza that can host both grand and impromptu performances. 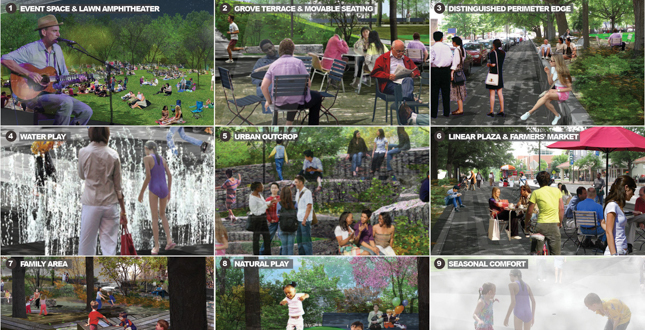 Natural play opportunities are embedded in the landform, and the gentle northern slope becomes an amphitheater or simply a place to sunbathe and people-watch. 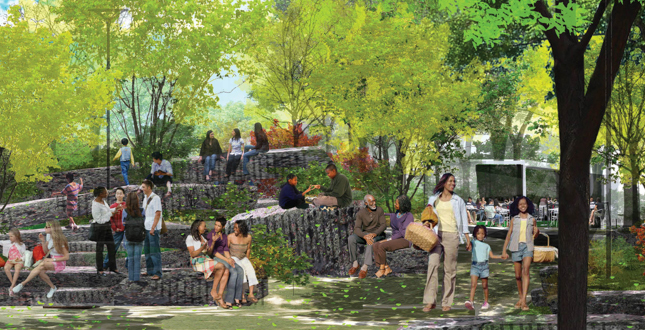 Sustainable practices such as collecting storm water in rain gardens and enriching habitat in the interpretative natural area ensure this design benefits the ecosystem and establishes a contemplative zone for reading and bird watching. In the new Moore Square, people will feel as if they are being pulled inside, and experience a sense of welcome, safety and excitement. The park becomes a civic theatre, while its edges, lawn, subtle slopes, and historic oak perimeter are animated, protected and invigorated with a successional planting strategy. Intensified activity throughout the Square reveals an iconic destination emblematic of Raleigh's vitality. 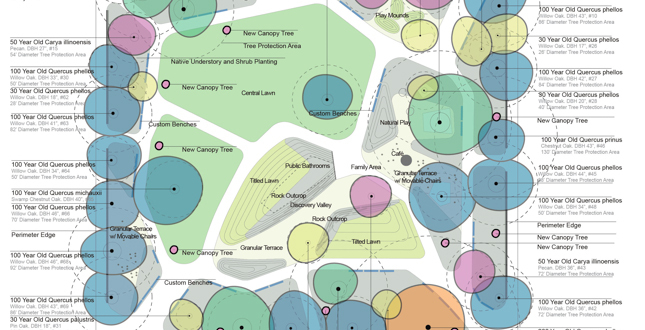 Moore Square's significance as an ethnographic cultural landscape was generated by civic use. Imagining its continued use in the 21st century, by expanding the possibilities for engaging social interaction, honors this historic progression. Moore Square has hosted a variety of different uses throughout the City's rich history. 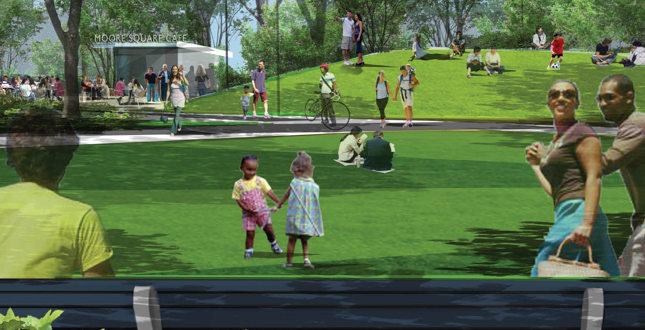 These uses include a common area for livestock grazing, a military parade ground, and barracks for African-American Union soldiers during Reconstruction, a site of a church and school, and a gathering space for Raleigh's historic Black Main Street and City Market. 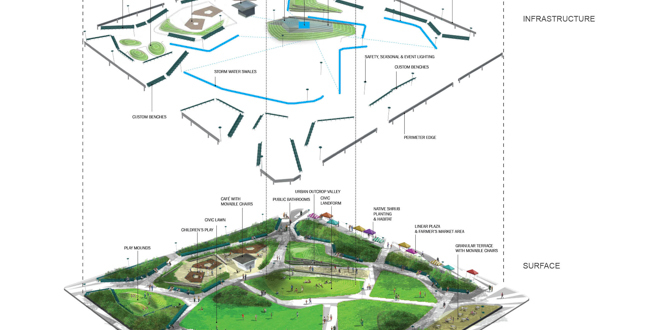 The possible futures for Moore Square explored through the master planning process respect it's National Register for Historic Places status and the Secretary of Interior's Standards that guide contemporary changes to designated properties. Rather than viewing the task as a compromise between design and preservation focused merely on the rehabilitation of a degraded cultural landscape, the planning evolved as a creative act of reading, editing and amplifying site conditions. Over its lifetime, the Square has changed dramatically in its physical attributes, but its use as a social space that accommodates the changing needs of the City have remained constant. Currently the Square is underperforming and not capable of reaching its highest and best use as a social space in its existing physical form. Therefore, modifications to the site that enhance its use as a social space and respond to the current needs of the City and are proven to be consistent with its historical heritage. Extensive dialogue was conducted in collaboration with the North Carolina State Historical Preservation Office, more than 30 city and state agencies, and the design team. 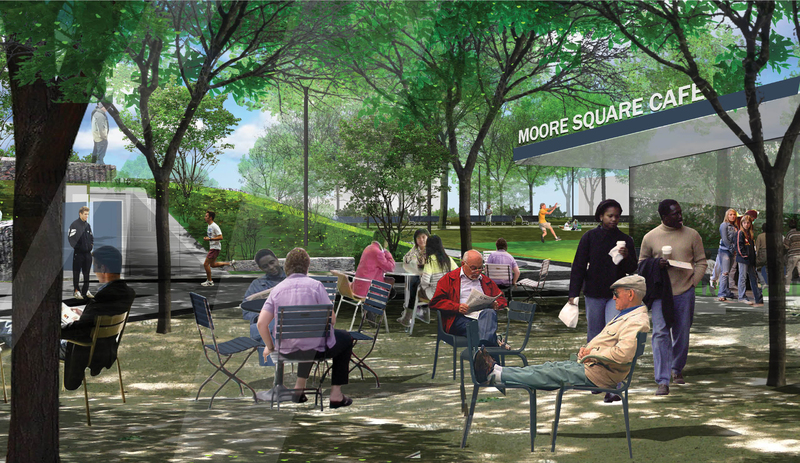 The extensive analysis and planning helped to articulate a more nuanced and project-appropriate understanding of the character defining features of Moore Square as a constantly changing living landscape. This enhanced “landscape specific” understanding helped to transform initial reluctance and concerns into broad public support for the project. Principles of sustainability are a major driver of the design informing a wide array of elements including long-term tree management, site program and material selection. The protection and longevity of existing trees informed all aspects of the design and led to several innovative design features such as elevated pavement details, a pier stabilized perimeter edge system to protect tree protection areas, an above-ground infrastructure core embedded inside the central landform, and a dynamic circulation system of unfolding views. 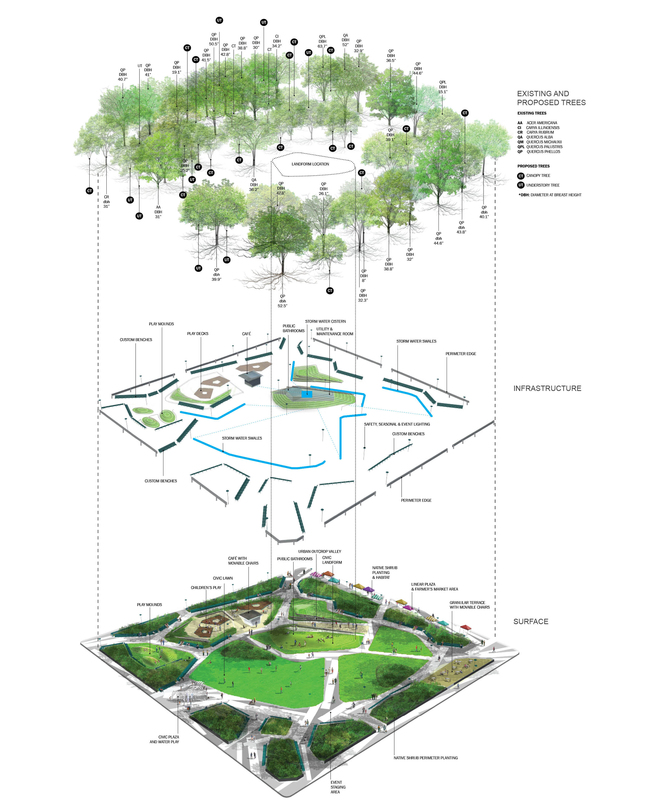 The landform collects and re-uses storm water on the site while enriching habitat through native plantings. This component has the potential to make Moore Square a key demonstration project of green infrastructure and sustainable design. The historic oak perimeter is preserved and enhanced through protective construction techniques, which safeguard the trees while allowing for greater occupation and enjoyment of the Square. 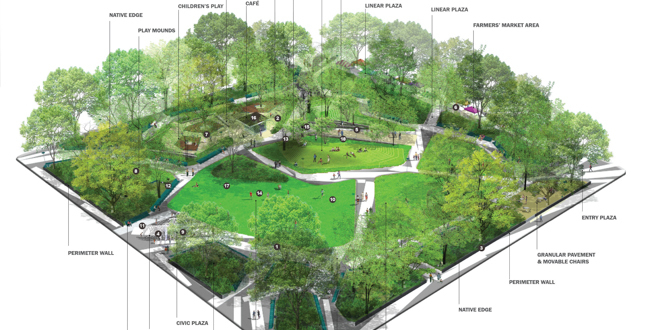 This comprehensive Master Plan aspires to create the framework for a respectful and forward looking design that elevates the 220-year old Square into a world class public space of civic dignity fitting of its honorific past.